Virginia artist Chuck Larivey’s Singular Focus – Variations on a Theme collection is one to behold! Larivey is known internationally for his captivating use of translucent light in oil paintings. Specializing in vibrant atmospheric and water effects, Larivey has a fabulous new collection of koi fish and water lily paintings that we are excited to display at the Stravitz Fine Art Gallery on Laskin Road. 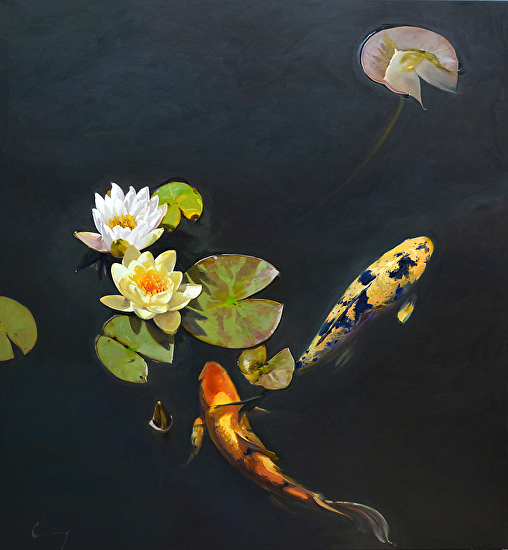 Larivey began painting koi and lilies in 2010, inspired by the koi fish at Maymont Park in Richmond, Virginia. He has always enjoyed painting flowers, and he quickly came to love the artistic freedom this subject allowed him in terms of colors, composition, size and scale. He also loves that this is a subject that can be enjoyed by anyone, anywhere in the world. Larivey has enjoyed having one “singular focus” to paint, as he feels this has allowed him to improve and perfect his new style of hyper-realism. The artist has always been fascinated with light and reflective objects. Understanding light and color as one and the same comes naturally to him. In all his paintings, he follows light and expresses it through vibrant colors. In his koi and lily collection, this is especially apparent in the green lily pads whose color pops out of the dark water. 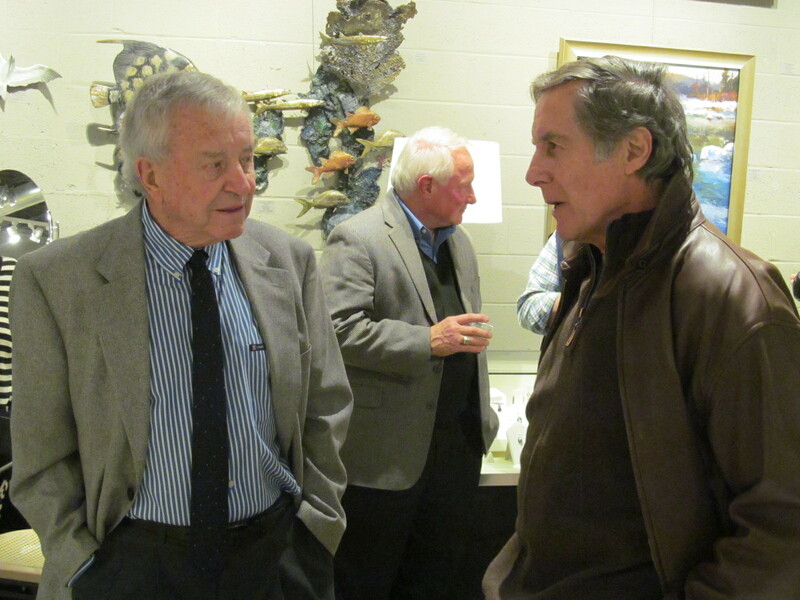 Chuck Larivey’s new collection will be on display at the Stravitz Sculpture and Fine Art Gallery on Laskin Road through the month of April until May 3rd. Come and experience these beautiful new works! Charles W. Kello was born in the Ghent section of Norfolk on August 19th, 1942. The son of a terrific commercial artist, Charles W. Kello Jr. and “Myrt” his mother. He is the first child among five children, introduced to art at the age of nine. His dad stated that young Kello “Just never stopped painting”. Since then, he began to receive awards as early as age twelve and even now at age seventy-one. As a teenager, he was an illustrator for several printing companies, before photography was what it is now. In order to reproduce ships and buildings, they had to be painted in detail, the reduced before printing. This gave him a firm foundation for his painting. 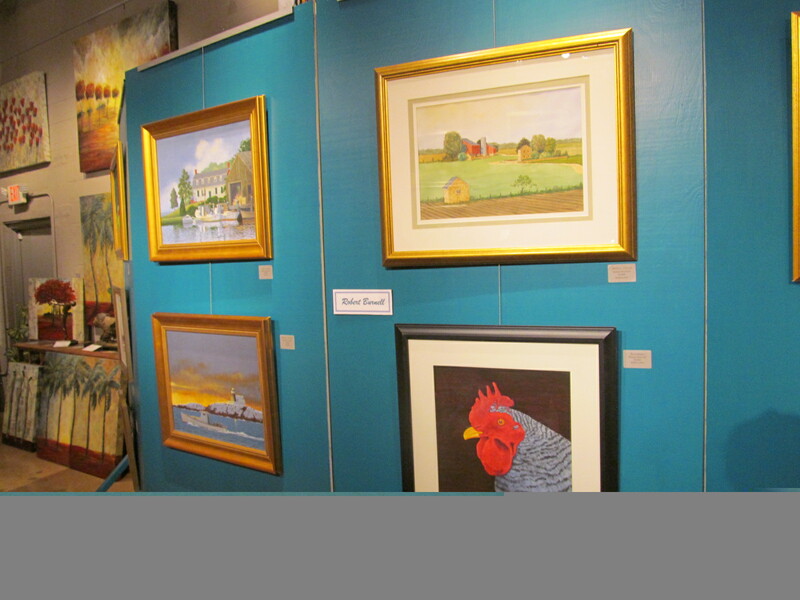 Charles is proficient in drawing, watercoloring, oil and acrylic. He has devoted his later years exclusively to oils. He has mastered landscape, seascape, still-life, florals, and portraiture. Charles states that this is a “Feat rarely seen in any artist”. This statement was also made by Vincent Price who bought several paintings from Kello in 1963. The following year Kello had a one-man-show in New York on Madison Avenue, which was a total sell-out. Kello has paintings in collections around the world. He commented, “From South Africa to Alaska, I have been quite prolific and painted over 5,000 pictures”. As one collector said “I have been looking at one of the landscapes I purchased three years ago and I still have not found everything in it”. “Last Flight”, a painting by Kello, was acquired by the Norfolk Museum, now known as the Chrysler. Kello teaches classes in oil at his studio in Norfolk. That is my “little painting factory”. Richard Stravitz Gallery on 30th Avenue and Pacific Street is the exclusive agent for Mr. Kello’s work. True words spoken by Anthologist Terri Guillemets. 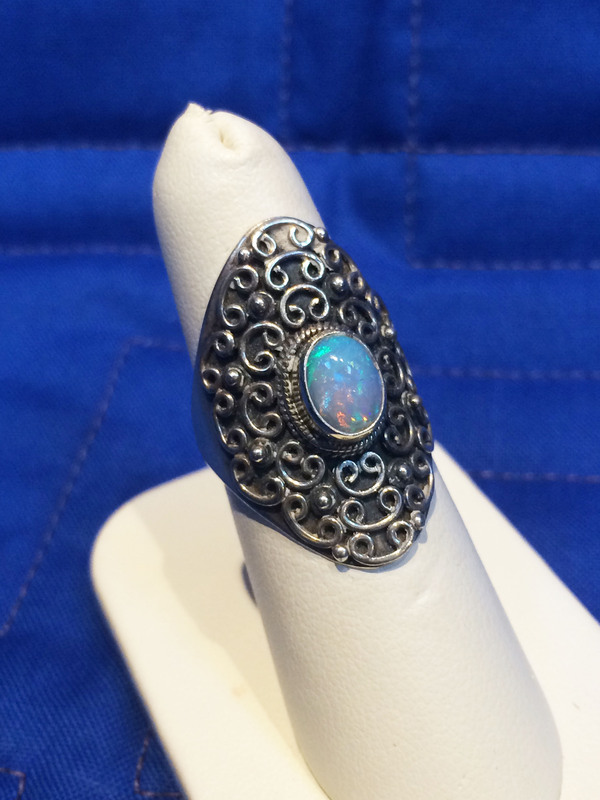 Opals have been around forever. Supposedly the Romans cherished this beautiful stone 200 years before Christ. 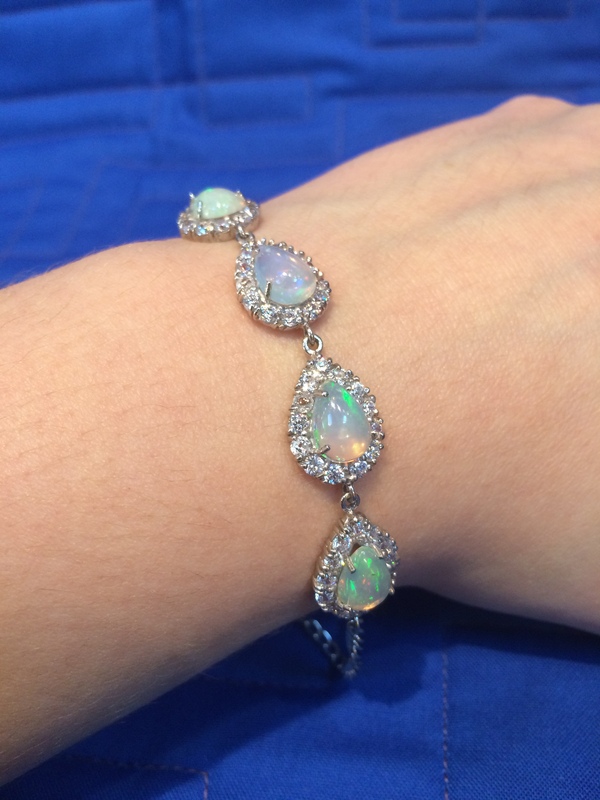 The Roman historian, Pliny, characterized the opal in eloquent words “…for in them you shall see the living fire of the ruby, the glorious purple of the amethyst, the sea green of the emerald, all glittering together in an incredible mixture of light”. I couldn’t agree more! 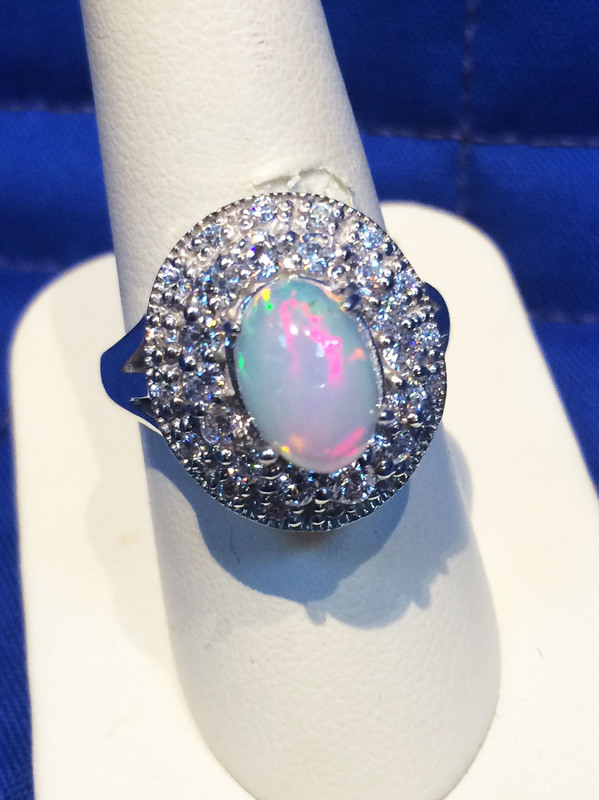 Put an opal in the light and you have a whole array of different colors at every angle. 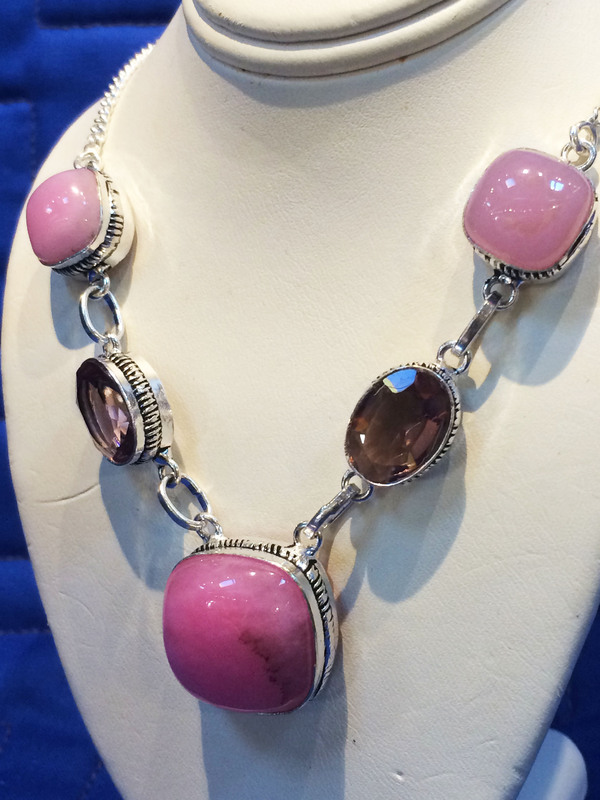 It’s amazing how a gem can be so subtle and striking all at the same time. 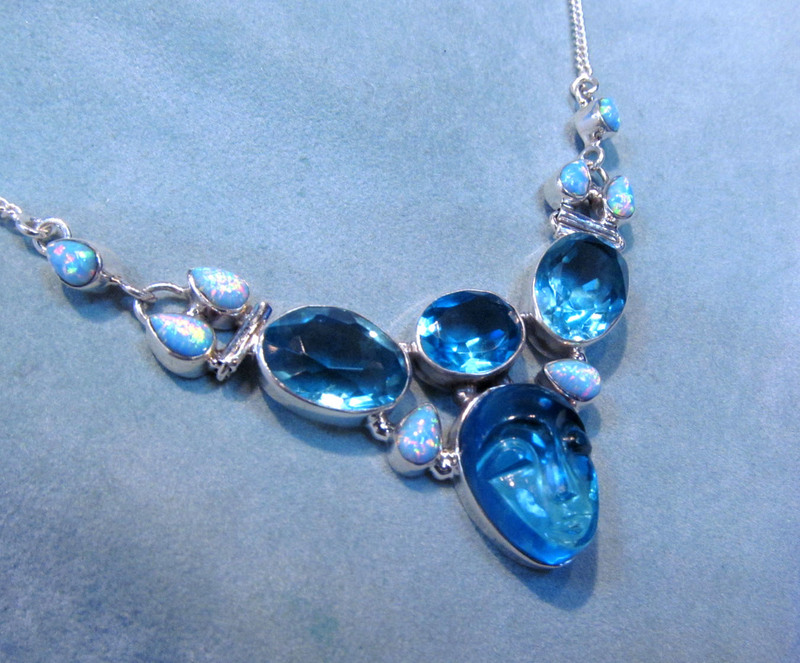 At our 30th Street gallery in Virginia Beach, VA, we just recently added a new jewelry artist to our family. 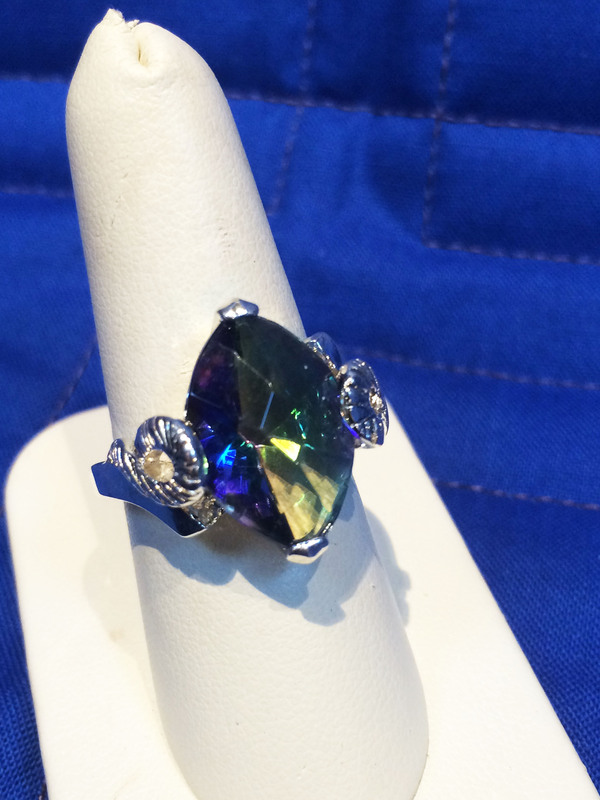 Brock Summs is a Virginia Beach local who hand cuts his stones and then has them set in various rings, necklaces, earrings, and bracelets. His work is quite remarkable! And opals are not the only stones that he cuts. There are various other cuts and designs. Wow!! Look at the face at the bottom stone! We are very proud to show case Mr. Summs gorgeous art work at our 30th Street gallery. 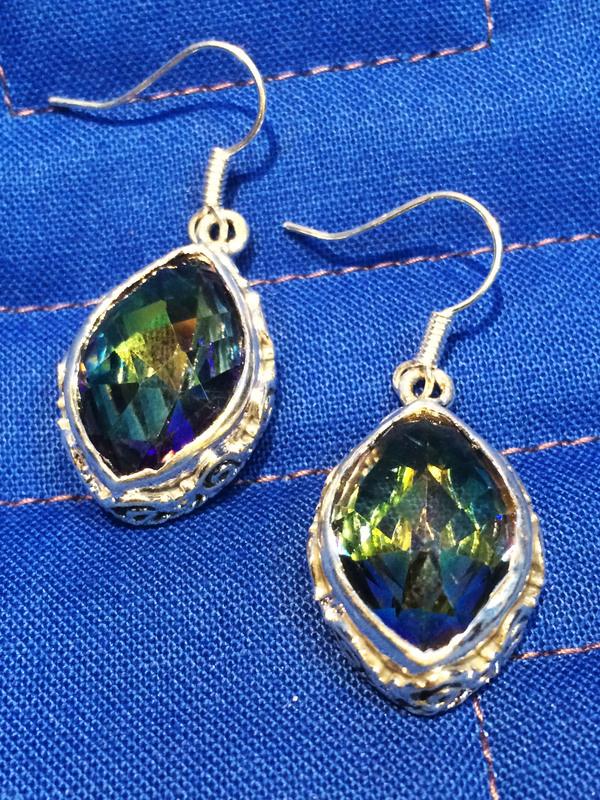 If you have any interest or questions of these beautiful treasures please call us at (757) 941-7905. 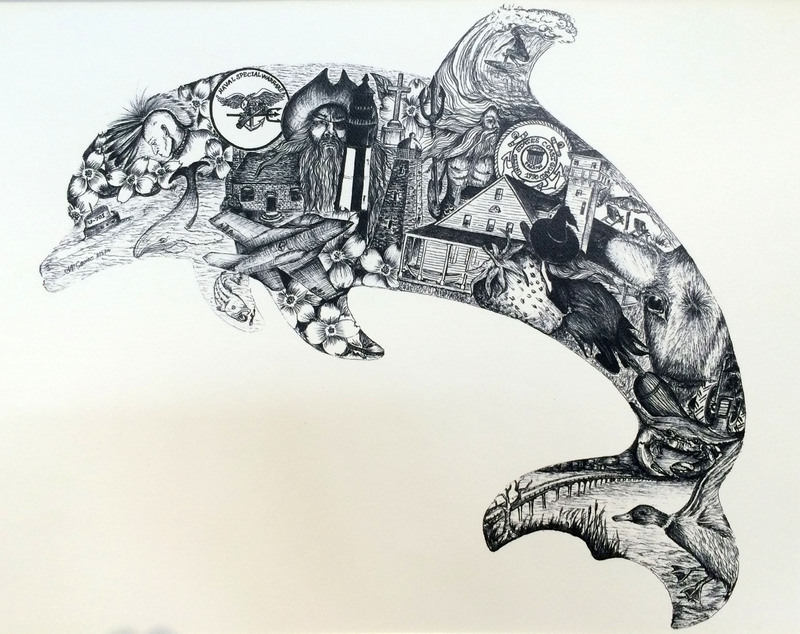 “Virginia Beach in a Dolphin” by Anne-Marie Savino. The piece won 2 awards at The Old Coast Guard Station and Museum: “Best in Show” by Director of Exhibitions, MOCA- Virginia Museum of Contemporary Art, and The People’s Choice Award. 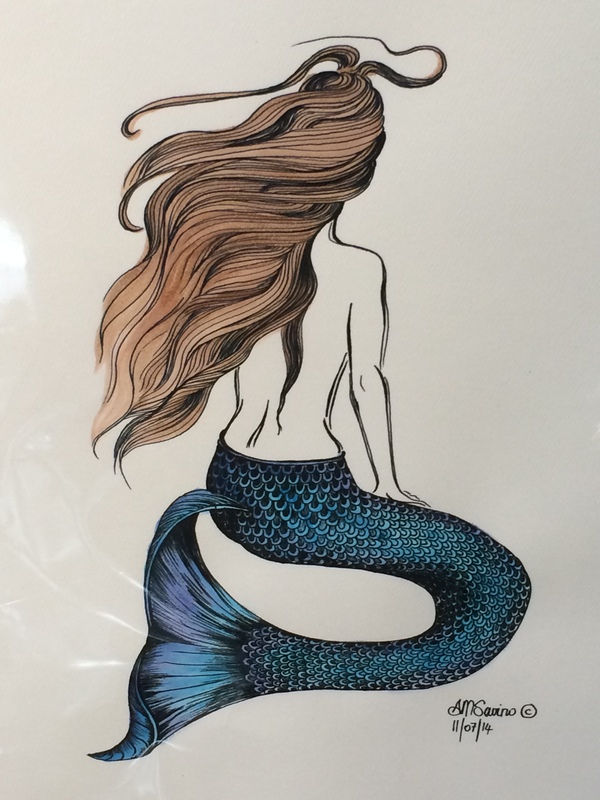 Anne–Marie Savino is an award winning artist from Virginia Beach. She has been passionate about drawing since she was a little girl. Looking at her work you would never guess that she was self-taught. Her work captures her emotions, mood, thoughts, and her feelings as well as the wide variety of experiences she has lived. Her preferred medium is pen and ink. Ms. Savino has quite a background! She is on of ten children/ Her childhood and youth were spent traveling all over the world with her family. She has lived in over 10 different countries in Sub-Saharan Africa where she experienced a wide range of cultures and languages. 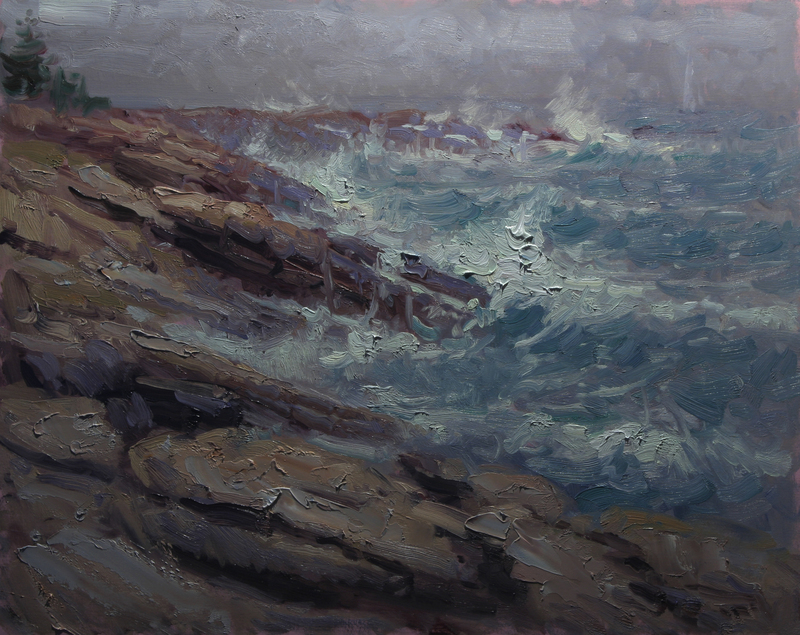 We are proud to feature her work at our 30th Street Gallery in, Virginia Beach VA.
Back by popular demand, renowned impressionist artist Andre Lucero will be demonstrating his Plein Air techniques for creating “seascapes”. 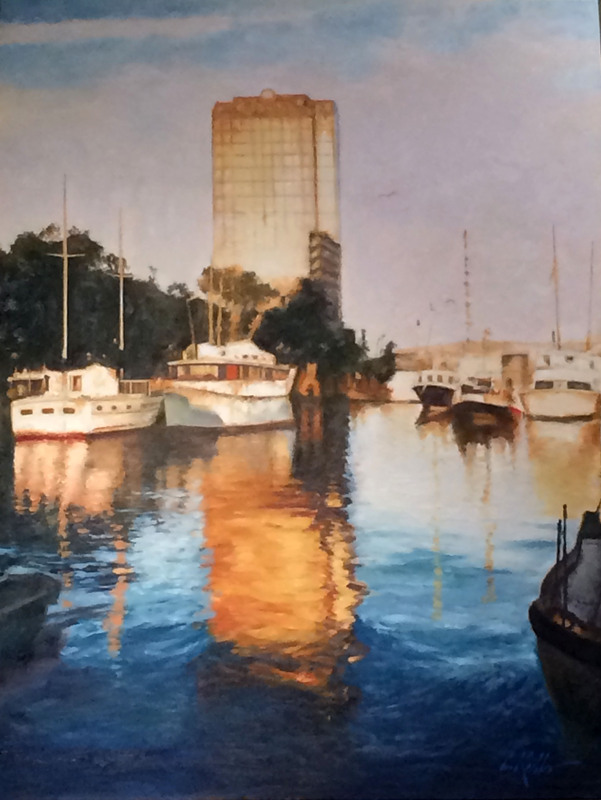 This will be his second time holding a paint demonstration at our Laskin Road gallery. Most of Mr. Lucero’s beautiful work is mostly comprised of Plein Air landscapes, still-life, and figurative painting. Mr. Lucero is one of the many fine artists we represent, and we encourage anyone who is in the area to come by and look at the many works we have on display. 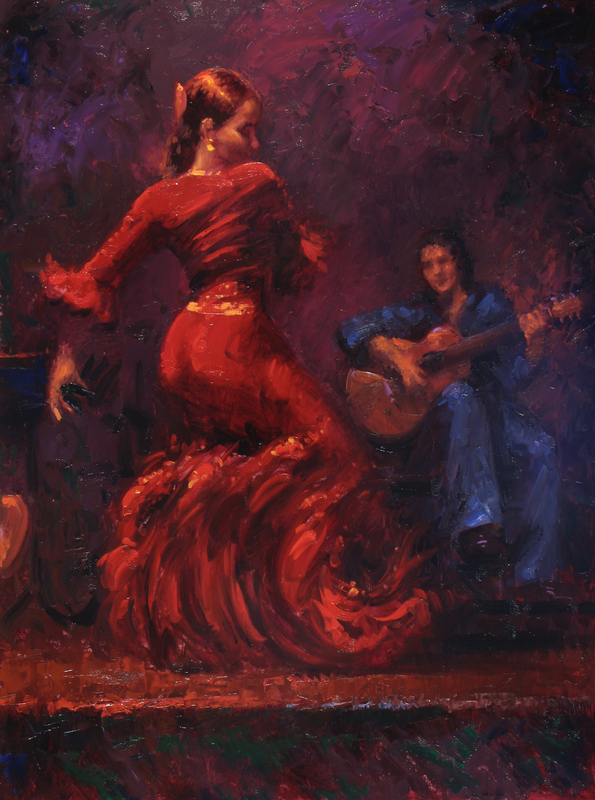 He shows so much movement in his work, and the lighting that he uses on some of his subject matter is quite dramatic. It reminds me of the Chiaroscuro technique that great artists, like Rembrandt and Peter Paul Rubens, used. Here is an article from the Richmond Magazine if you are interested in learning more about Andre Lucero. The demonstration will be held at 1217 Laskin Road, Virginia Beach, VA 23451. If you are in the area and would like to attend the event, then please call us at (757)305-9411 to reserve a spot. Seats are limited so be sure to book ASAP. 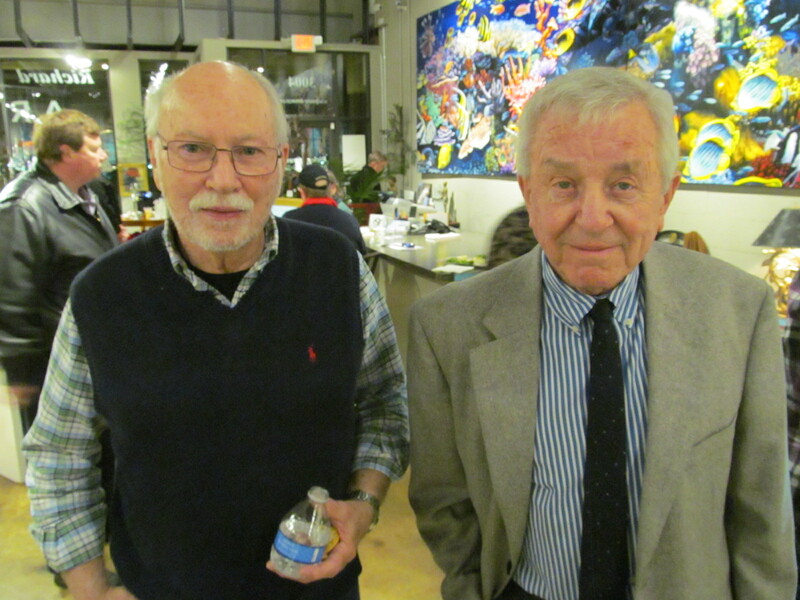 This past Saturday (January 17th, 2015) our 30th Street gallery held an event in honor of two local artists of the Hampton Roads, Virginia area, Robert Burnell and Thomas McLauchlin. It was such a pleasure getting to know both of these gentlemen and learning a little of their history. Both are Portsmouth, VA natives. To learn more about Robert Burnell and see more of his work Go Here. Also to learn more about Thomas McLauclin and see more of his work Go Here. This will give you an idea as to what you will find at our 30th Street gallery in Virginia Beach if you are ever in the area and would like to stop by. There was a huge turn out for this event! 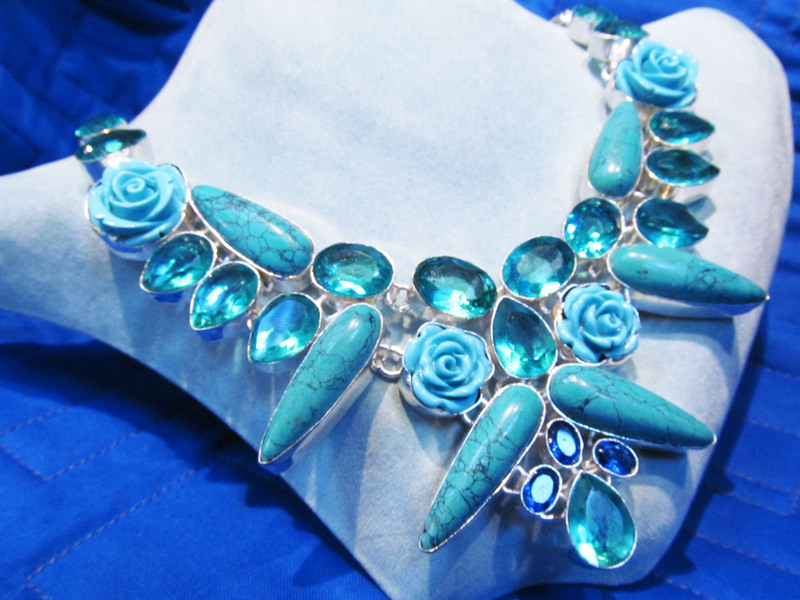 So many people were impressed with the various art works and jewelry we have to offer. I love going to these events and watching peoples reactions to the various sculptures and artwork. 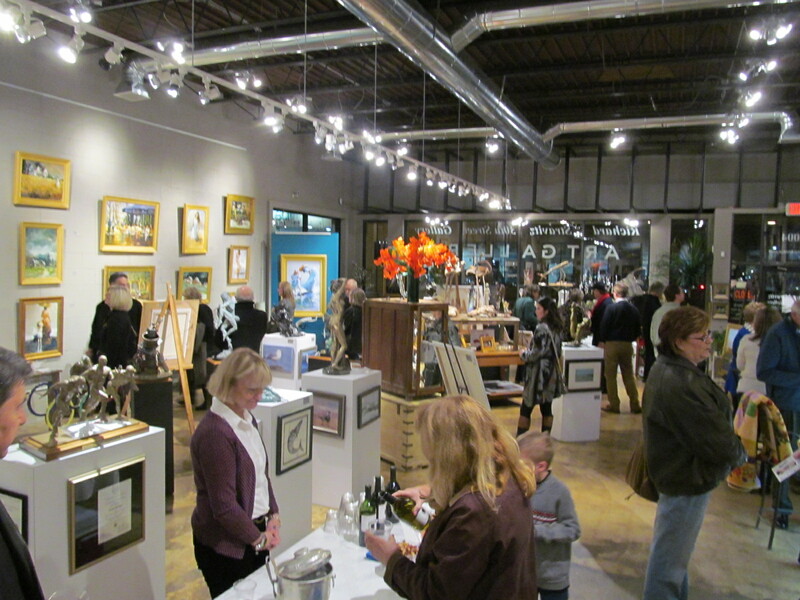 I’ve always felt that our 30th Street gallery is the perfect place to start for any first time art collector. The Old Print Shop | New York City as Art or Imaging the City. It’s always so interesting to see a progression of a state, or city, or country even. What is different now? What stayed the same? I would love to see this exhibition! The oldest painting is from 1671!! Wow!! The exhibition covers almost 350 years of art based on New York City as a theme. The earliest is Ogilby’s Novum Amsterodamum from 1671 and ends with images by a group of contemporary artists.